Dining out is one of my favorite things to do. These are my experiences and culinary adventures in eating out. We have been meaning to go to Lardo since it opened in place of Johnny B’s, an early morning greasy spoon staple on the corner of Hawthorn and the mess of Ladd’s Addition. 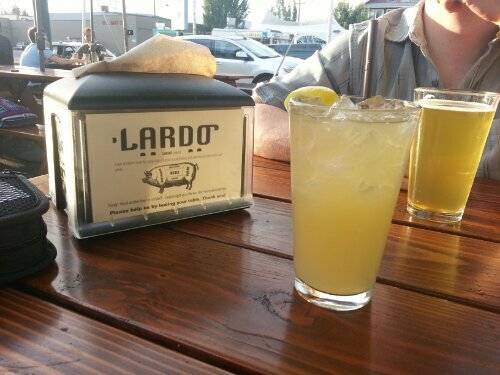 Well, when I got off work on Thursday I didn’t feel much like cooking, so we decided to finally give Lardo a try. As you can probably tell from the title of my post, the name of the establishment, and the logo on the napkin holder, Lardo sells pork. Delicious, fatty, crispy, salty, piggy pork! I had read the menu in the past, put apparently it had been updated. There was no Porchetta on the menu before, and so I wasn’t looking at it. I was reading the menu piece by piece, and my husband looked at me and said, ” Well I don’t even have to ask you what you are getting.” I gave him a sort of quizzical look, because I had no idea what I was getting besides something called Dirty Fries. 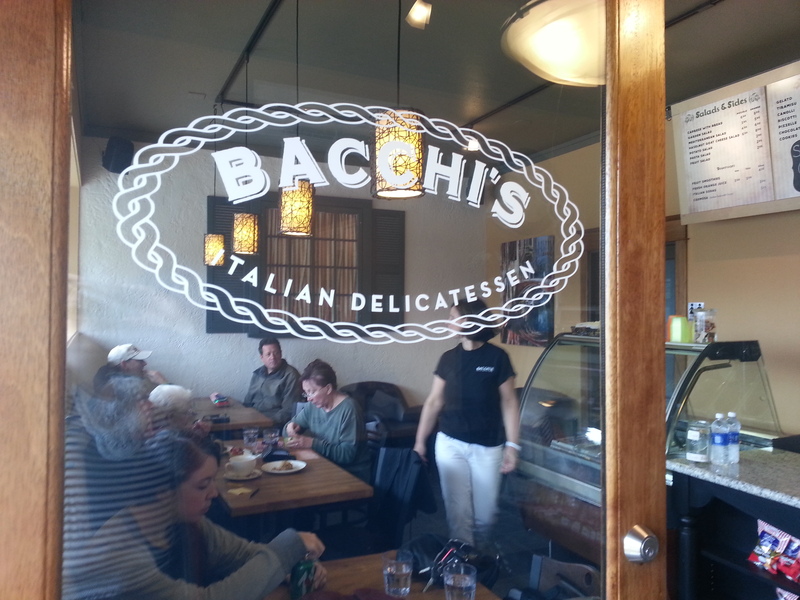 He pointed to the bottom of the menu and said, “You are getting the Porchetta.” At which point I promptly squealed loud enough that the people around me turned to see what the deal was. I cant really describe the excitement I felt. It was something akin to pulling into the Disneyland parking garage…. yeah, I know I have issues. But hey, I have been seeing this sandwich on the food shows and lusting after it for months, and it was about to become allllll mine. Porchetta is the tenderloin wrapped in the belly, with herbs and spices, then bake or rotisseried or whatever, cooked, until the skin on the belly is crispy and of course the juicy delicious meat is done. 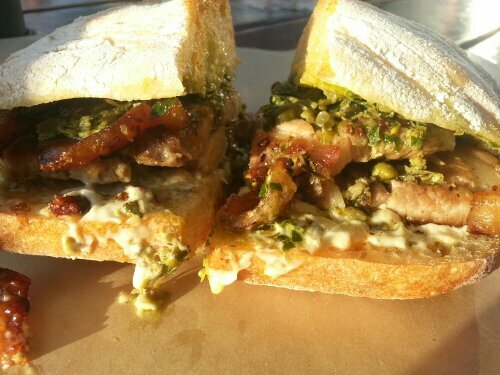 On the sandwich they put two heft slices of porchetta, some caper mayo, and a gremolata that is TO DIE FOR. I mean just look at it. The first bite sent pork juices, melty mayo and oils dripping down my chin and hands, and I was in love. After the first bite, my husband asked me how it was and reached for a bite, and got the I WILL KILL YOU IF YOU TAKE THIS FROM ME RIGHT NOW look of death. Eventually, I gave him some. Actually, I only ate half of it because it was so rich, and he ate the second half for lunch the next day, so I consider that a compromise. 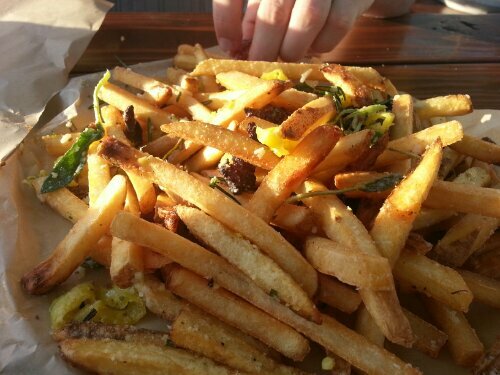 These are the dirty fries. They are tossed with coarse salt, parmesan cheese, fried pieces of pork scraps, fried sage and rosemary leaves and pickled banana and cherry peppers. They were amazing, especially when you got a bite that had a little bit of everything. It was a symphony of bold flavors that made you want to roll around in a tub of it…. or may that’s just me. Like I said, I have issues. I paired my food with a Kentucky lemonade which was house made lemonade and Evan Williams Bourbon. It was quite the refreshing beverage, and perfect for the warm summer evening. Needless to say, if you are in Portland, PLEASE go to Lardo. 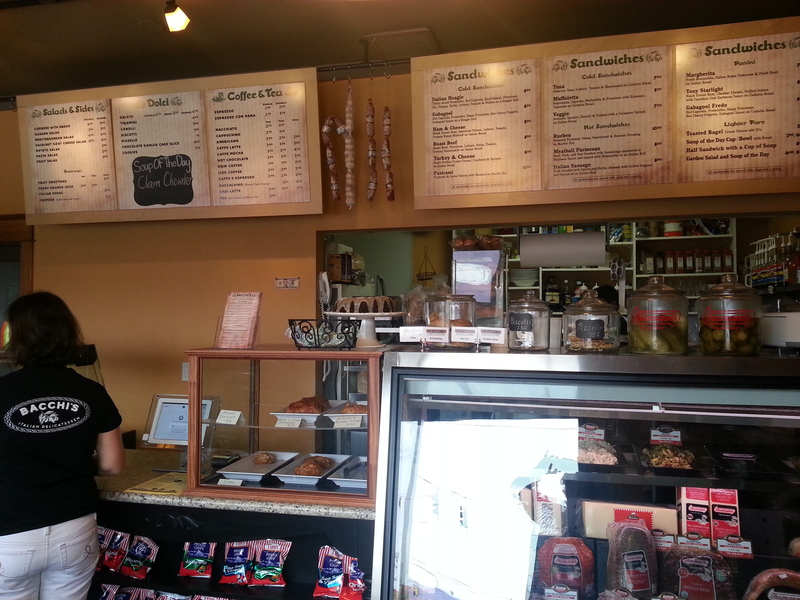 Get the Porchetta sandwich. 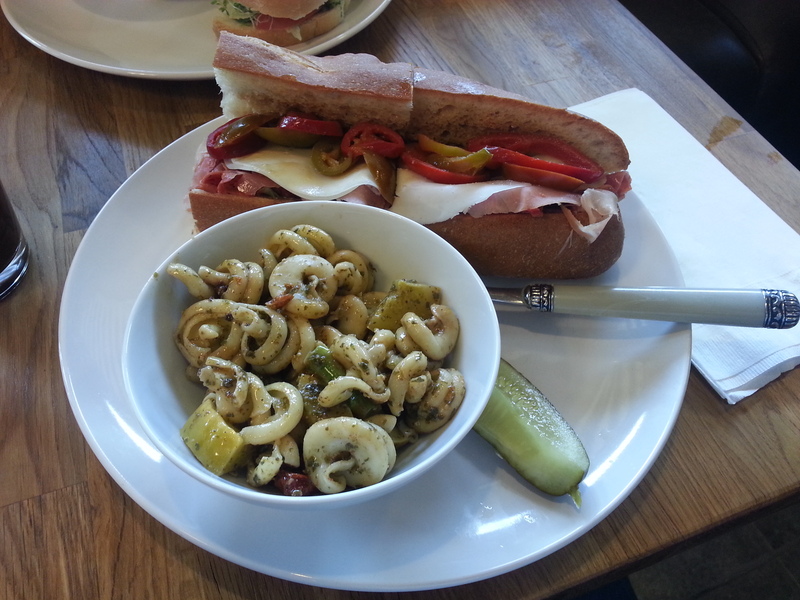 Have a love affair with your lunch. 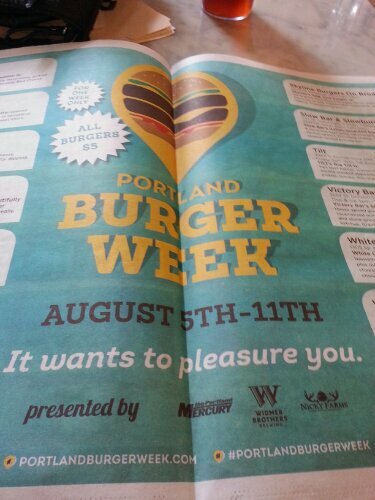 So this week, Nicky Farms ( a high quality local meat distributor) is teaming up with the Portland Mercury and 13 local restaurants to offer $5 specially created burger masterpieces. This is a one week offering with 13 options to try. As a foodie my initial reaction is I MUST TRY THEM ALL! As a weight and health conscious woman my initial reaction is “this is cool but I won’t be able to try them”. Where do we draw the line in food exploration so that we can help open up the amazing world of fine crafted foods to our public without sacrificing our bodies? Can you be both a foodie and a health conscious “dieter” at the same time? These are my musings for today.